January 29th is Puzzle Day, and at Current we have lots and lots of puzzles, for all kinds of people and all kinds of skill levels. In fact, we have so many puzzles, you might say it’s a puzzle-palooza around here! No matter what your puzzle passion, we can handle it. We understand your passion for puzzles; they’re almost addicting. When you sit down to put together a puzzle, the cares of the day just seem to melt away, and the stress you may have been carrying around all day is soon replaced by the thrill of victory as you find the pieces that fit together one by one. Puzzles add so much more than just entertainment to our lives, they’re quite educational and therapeutic. Did you know that puzzles help develop cognitive and problem-solving skills, fine motor skills, and hand-eye coordination? Working a puzzle is good for our brains, engaging both sides simultaneously. Jigsaw puzzles have been around for centuries, and it doesn’t look like they’re going anywhere. What began as hand-cut wooden educational tools in the 1700s has evolved into a huge, worldwide industry today. 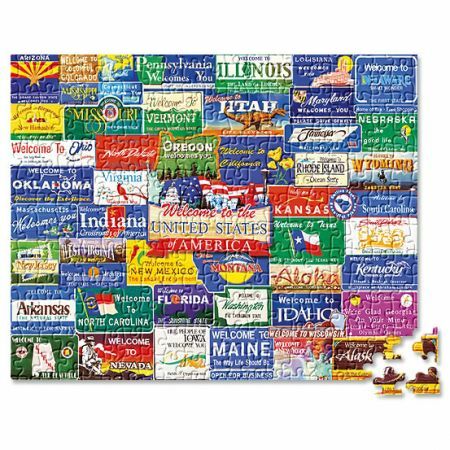 Children and adults alike enjoy working jigsaw puzzles, whether it’s a toddler playing with a cardboard or wooden puzzle with as few as six pieces or an adult putting together a 1,000 piece puzzle. According to the Guinness Book of World Records, the puzzle with the most pieces consisted of a whopping 551,232 pieces. The huge jigsaw puzzle depicted a lotus flower with six petals which symbolized the six areas of knowledge involved in the mind map study method. The colorful puzzle was assembled by 1,600 students at the University of Economics of Ho Chi Minh City in Vietnam on 24 September 2011. The students spent 17 hours putting the puzzle together, first breaking it up into sections containing 176 pieces each, and then re-assembling them to create the puzzle. That’s a gigantic jigsaw! 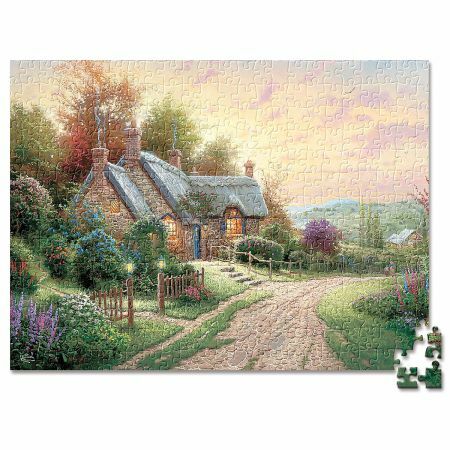 One of the great things about jigsaw puzzles is the wide variety of pictures, patterns, colors, shapes, and sizes that are available. Puzzle themes can be almost anything you can imagine! There are puzzles featuring animals, landscapes, seascapes, geometric shapes, skylines, maps, flowers, plants, jungles, people, messages, famous paintings, food, special holidays . . . the list is endless! Puzzles help us learn, sharpen skills, improve memory, relieve stress, and allow us to play. Puzzles have stood the test of time and are so much more than just “toys”. They’re a great way to pass some time, unplug from electronics, engage our creativity, and relax. Pick up a puzzle or two today and enjoy some quiet time alone or with a loved one. You don’t have to wait for National Puzzle Day, take a look at our puzzle category – we’re certain you’ll find a puzzle that appeal to you!